My mom came to visit a few weekends ago a brought me a whole pile of vintage patterns – dating from the 40’s up to the 80’s. As I’m drooling over them all I come across a Beehive pattern book called “Baby Styles”. It looks like it’s from the 50’s. They have these cute names for all the patterns, like one called “Wee Willie Winkie”. It made me giggle just reading it. As I’m flipping through this book, drooling and giggling I see a crocheted dress and I take a closer look. 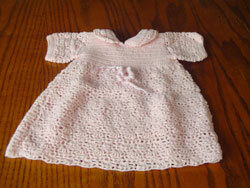 I looks familar – it looks like a dress my mom recently gave me that my grandma made for me as a baby. I go upstairs and get it out of the closet and compare. Sure enough it’s the same dress! My grandma altered it a little bit to add a ribbon around the waist, but other than that it’s the same dress. The coolest thing is that my mom bought these patterns at a garage sale – so it’s not like this was my grandma’s pattern book. By some coincidence the dress and pattern have been reunited. 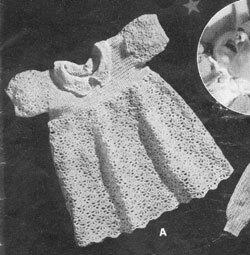 From the pattern book “Baby Styles” by Beehive. The dress my grandma made for me (and BTW I was born in the 70’s not the 50’s 🙂 ). That is amazing, maybe your grandmother had that magazine stashed away long before you were born. Do you think you could still find her copy? Oh my gosh, what a great story. She had a lot of beehive pattern books so it’s no surprise that she might have had this one. I just love it that you still have the dress. And I love it even more that this happened now, so close to the anniversary of her passing (Nov 3rd). I’ve been thinking about her so much lately as I’ve been using her sewing machine and leftover embroidery thread to make Christmas gifts. p.s. I have a similar reuniting story on my blog today! You know it’s possible that her copy is still around. My mom saved a lot of my grandma’s knitting things – being a knitter too. Next time I visit my mom I’ll have to go through her knitting things again and look.